Is there a perfect dress? I have argued that the perfect dress isn’t a “Designer” dress, or “Occasion” wear. It is not an item that cost a lot of money or one with an incredible “wow” factor. For me the perfect dress is one that can be worn anytime, for any occasion, and it always makes you feel your best. It gives you confidence because you know it enhances you, rather than just speaking for itself. While many clothes look absolutely splendid on a tall, skinny, youthful model, very few look as good on ordinary women. In fact there is much mirth to be found in the idea of dressing head to toe in one of these outfits and actually going out. In my opinion the “perfect” dress is actually a supporting act. It enhances who you are, what you look like, making the most of your attributes, and disguising your less desirable features. When I was being trained we called them “figure faults” (I remember making an alteration for a Dowagers’ Hump! ), although nowadays we have to be a lot more tactful. In fact, I actually have an aversion to words like “saddlebags” “cankles” “double-bust”, “dumpy” etc as they are normally used to undermine women’s confidence. But, by the law of averages, women’s bodies are very varied and less than 10 per cent of us will fit an off the peg item to perfection. So, let’s reiterate what a perfect dress must do. There is a small chance that a RTW item will be “perfect” but I usually find that at least one of the above must be compromised. The only way to achieve all of these elements, every time, is to go bespoke. For the wealthy having a tailor make up exactly what you want is very attractive. And although getting exactly the right dress or trousers or coat might be a great investment as you know you will wear the item until it disintegrates, you have to know what to ask for and this can be challenging. The same thing is true of making your own clothes. Many women spend hours making up an item “straight out of the packet” – without fitting it. They choose fabric in a colour that they love, but simply doesn’t suit them. They make up an item which is fashionable – dungarees anyone? – or by a designer they like, or something which is doing the rounds on the blogs. And the said item is just not for them. Look at the sewing blogs and you will sadly see lots of this going on – just because you can sew doesn’t mean you know what works best for you. I decided to experiment. I know what dress shape suits my body best – it will be fitted above the hips, then flare out in an A line, and end just above or on the knee. It will have sleeves of some description and the neckline will not be too low, nor too high, with a graceful curve. I chose to make the simplest version I could find that would meet these criteria. A good basic princess line pattern, but the model’s not happy. I used a McCalls 3129 pattern. I am surprised anyone would buy this pattern as the woman on the envelope looks as dowdy as they come. But of course it is just a princess line dress that is relatively easy to get a good fit in the upper body without relying on a waist seam. The colour, to suit me, would need to be cool, bright and not too dark. 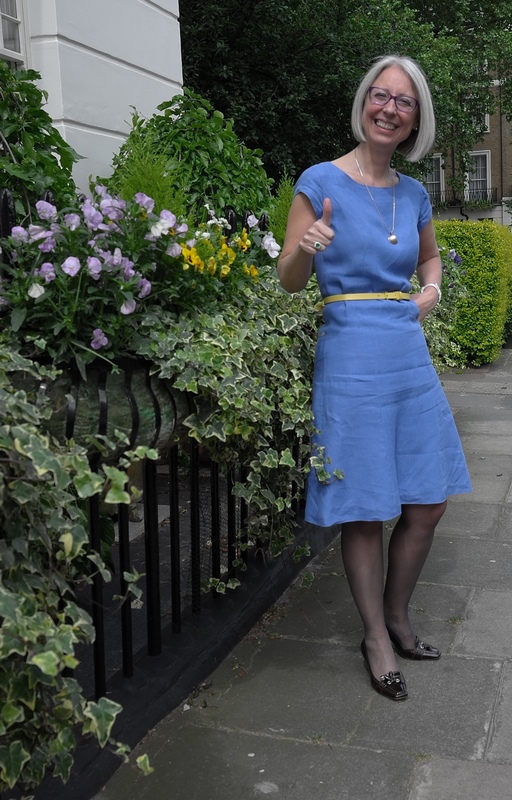 I chose an inexpensive linen from Simply Fabrics, in a nice blue shade that complements my colouring, and made up the dress. I worked on the fit, but the neckline is a little wonky. Excuse me. What do you think? I feel relaxed and happy in it, despite it being a very simple dress. It is a dress you can dress up with a colourful belt, or jewellery, but its ideal for everyday. I think it makes the most of my figure, and lights up my face. It is not obvious, or fashionable and won’t get many comments. But to me it is a perfect dress. I absolutely agree with your definition of ‘the perfect dress’, something I have learnt through trial , error, age and way too many style disasters. I have a wardrobe full of dresses that would look fantastic on someone with different colouring, longer legs, smaller hips. ( I feel an ebay session coming on!) . Having the hem taken up and other minor alterations doesn’t always work either as then the proportions are often wrong. Lucky you and your bespoke skills! So, the periwinkle dress. I think you’ve hit all three buttons. The colour, intensity and shade look fantastic with your colouring, the cut and style enhances your figure and the personal fit is what makes it all come together. Personally, I would be tempted to recreate that dress in lots of other equally suitable colours. Will you? Good question. Logically I should – Jackie O was said to buy her favourite items in several colours. But I suppose I hanker after variety. What is your perfect shape ab? Princess seams seem to suit every body shape, and as you say Manuela help us to fit closely. In RTW they seem fairly rare (except perhaps for lingerie and swimwear). I have recently discovered your blog. I love your style and the garments you’ve made. 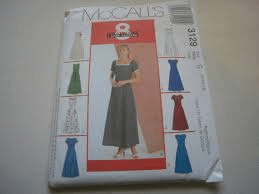 in this post, you refer to a site but I’m not sure which site you are referring to when you say, “You can see my review on the site.” Also, the label for this entry is Butterick 3129 but the pattern is McCalls 3129. Hi Zeddie – thanks for stopping by. The pattern is indeed a McCalls pattern, 3129. I wrote a review of it on the sewdirect site. I hope this link works! I couldn’t agree more with your definition of a “perfect dress”. I make the same silhouette (very similar to the pattern you show here) with shoulder princess seams out of many different fabrics – from lawn to wool crepe. I call it “my dress” pattern, which has morphed over the years to have a 3/4 sleeve with a dart and a scoop/rounded neckline. I feel confident cutting into even the most precious fabric because I know it will fit.